Christiaan Hetzner covers the German market for Automotive News Europe. 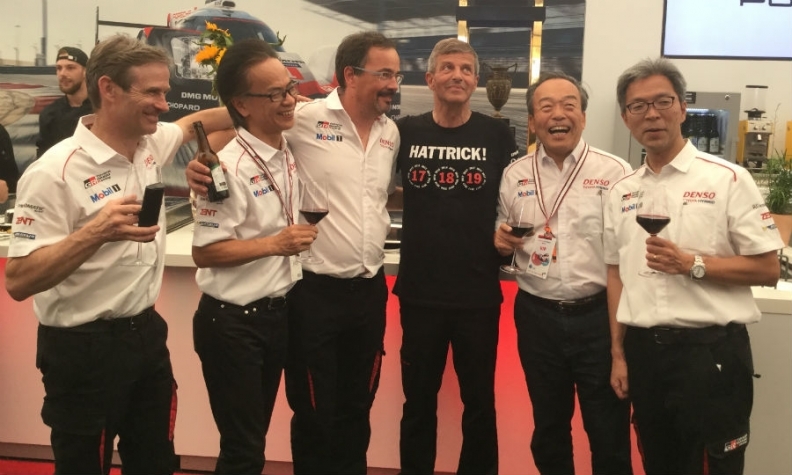 Friendly rivals: Porsche Le Mans chief Fritz Enzinger (fourth from left) with Toyota executives (from left) Pascal Vasselon, Shigeki Tomoyama, Rob Leupen, Takeshi Uchiyamada and Toshio Sato. In Porsche's hospitality suite not far from the race track, Toyota executives gathered around the meter-high trophy handed to the victor of the 24 Hours of Le Mans. Porsche had won the race for the third year in a row on Sunday after early favorites Toyota, who had set a new lap record in qualifying, suffered one disaster after the other. In an attempt to stack the deck, the Japanese carmaker sent in a third car to compete, and yet only one of its TS050 hybrids managed to cross the finish line far behind. It was the 19th attempt. Among the Toyota people, Toshio Sato, team president of Toyota’s LMP1 program, playfully reached out to grab onto the prestigious silverware for the cameras at one point, while the man dubbed "Mr. Prius," Takeshi Uchiyamada, posed clasping hands handwrestler-style with Porsche LMP1 chief Fritz Enzinger before allowing himself a glass of red wine. Wearing a tee-shirt commemorating three straight victories for his team, Enzinger looked skyward as if to thank his lucky stars secretly. Despite a busted electric motor that threw it all the way to the back of the field early on, his second car came from behind to win after the other Porsche 919 Hybrid was forced to retire. "You don’t choose to win Le Mans, Le Mans chooses you," goes the saying. In the end, executives from an industry otherwise known for singling out competitors for mockery whenever possible celebrated together the drama that marks a highlight in the annual racing calendar. "This is what we call Spirit of Le Mans," FIA's World Endurance Championship tweeted after seeing the picture. It was this feeling of mutual respect and sportsmanship that is forming the basis for an unlikely friendship between the heads of the Porsche and Toyoda families that control the world’s two largest carmakers, Volkswagen Group and Toyota. It started a year ago at Le Mans when the chairman of the financial holding that owns a majority of Volkswagen, Porsche SE’s Wolfgang Porsche, sought to pay his condolences to Toyota. Moments before the Japanese carmaker was due to win its first Le Mans title, its lead car failed gifting the race to the Germans. Accompanied by VW Group CEO Matthias Mueller, the 74-year old patriarch went to the garage of his opponents, consoling them with the words that while Porsche was first, the champion was Toyota. That gesture of sportsmanship prompted the two family heads to meet in September last year during the Paris auto show. Wolfgang Porsche invited the company’s president, Akio Toyoda, to Le Mans, Porsche’s backyard after a record 19 titles. Despite being a renowned motorsports fan, Toyoda had never attended the race as head of his company. Officially it was due to the stockholder meeting inexplicably always clashing with the race, but company sources say he also didn’t want his presence distracting from the goal or piling further pressure onto the team. This time, however, he couldn’t refuse Porsche’s request. What he witnessed his first time there, prompted him to take personal responsibility, apologizing directly to the pilots for believing in the cars as he told them before the race. “I can only say how sorry and how full of regret I am,” Toyoda said in an emotional message after the race. While Le Mans didn’t turn out to be the fairy tale for which he had hoped, Toyoda returned the favor. Wolfgang Porsche hopes to now attend the 6 Hours of Fuji as a guest of the Toyota president. While the two carmakers remain worthy opponents on road and track, their two controlling families are forging ties on the basis of this mutual respect, ties that may be fortuitous for the whole industry at some point in the future. And Toyota isn’t giving up. Citing the popular saying about who wins Le Mans, its race team tweeted they will be back for a 20th attempt. “We hope one day it will choose us.” One thing’s for certain, Wolfgang Porsche would not begrudge them for it.